Size 8.5" tall X 6.5"
Size 4" tall X 32"
Transfer taped for super easy install!! instructions! Ford F250 F350 RACING CHECK Cowl Hood Accent Stripe Set! These are a super easy way to make your Truck standout from the rest!! 2 (PAIR) of 2005 - 2015 Mustang 3" Twin Sport Fender Hash Mark Stripes! All of our decals and graphics are made with top grade vinyls! F250 F350 FADING HOOD Accent Stripe Set! The kit contains enough stripe to due the hood only! You will get 1 Roll's each 20" wide and 68" long! These are huge! 2015 - 2018 Mustang Plain Rocker stripes Style #2 Set! 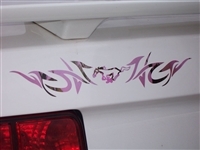 These are a super easy way to make your Mustang standout from the rest!! can be cut for hood scoop and works on cars with flat or cowl style hoods! Will fit on any car or truck on the road! Sold as 2 Pair One set of stripes for each side. Please choose your color from the drop down menu below.